The Zenobia is often referred to as one of the best wreck dives in the world. The Zenobia or Zen off the coast of Nicosia, Larnaca, Cyprus is considered to many divers as one of world's greatest wreck dives. The MV Zenobia is a roll-on-roll-off ferry built by Kockums in Malmo, Sweden in 1979. This 172 meter long and 23 meters wide ship ferried passengers and their cars around the eastern Mediterranean. On her last trip from Sweden to Syria she sank on June 7, 1980 just a few miles offshore Larnaca's fishing harbour. The Captain had problems steering the ship and saw that water was being pumped into its ballast tanks. In Piraeus, Greece, engineers and the captain considered the problem to be solved and continued their journey. But when the ship started listing to its port side even more, the captain decided to ask for help and entered Larnaca's harbour. She was fully loaded with 108 trailers, trucks and thousands of tons of cargo, when engineers decided that there was nothing else to be done than letting the vessel sink. Everything on board, worth over three hundred million euros, went down with her to the bottom of the ocean. There are many stories about her last voyage and the reasons why she sank. Some say it was caused by computer errors or an insurance scam while others blame Middle Eastern security forces for its sinking. Its most popular theory is a failure in the computerized ballasting software as this failure was mentioned en route to Larnaca. You can still look at all the lorries that went down with her as none of them have been removed. Some are still attached to the wreck with chains, but many have been scattered across the seabed. 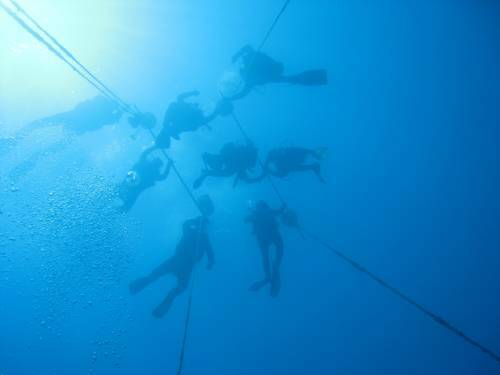 She is by far the most popular and best known dive site in Cyprus, famous all over the world. Today she rests on her side in waters of forty meters deep reachable by all levels of recreational diving. The wreck's deck is completely vertical with its top railing located at 17 meters deep. Dive centers can easily spot the wreck as there are several mooring buoys at the bow, stern and amidships. Its one hundred meter long aft truck passage is excellent to swim through. It is generally safe to penetrate parts of the upper deck but we advise not to enter rooms at the lower decks without the proper wreck dive training. Several divers have died because they were disillusioned by the narrow passage ways, dead ends and many side ways. Be careful for loose wires, silt and seaweed which you will find inside the wreck. You can visit the canteen and accommodation rooms which are all still full of the regular equipment we still have nowadays. You will see coffee machines, drink dispensers, drinking glasses, pots, pans and bottles of beer and coke. You can visit the port side engine room through a hatch in the lower lorry deck. There you can see its engine, ladders, gantries and original engine fittings. Other sights are two huge intact propellers, a few cranes, both its anchors, several life boats, its main mast and a winch gear. Loads of its cargo has never been recovered and still lies on the bottom of the sea covered in the sand. You can find industrial machinery, paint, air conditioners, timber, Tonka toys and even eggs. During peak season you might be lucky enough to spot an underwater tourist submarine which shows the underwater world to non divers as well. Marine life is great with loads of barracuda, jacks, sea hares, tuna and grouper that hover in the current and there are always interesting items to be found in the sand. Plenty to see at this excellent often high visibility dive site. Have fun! I would like to do this dive when i come over, however is there another wreck next to it. Friends of mine at the Army Base said there is another wreck next ot it. We will add more dive sites in this region soon.